Richard's Annual Judging Kata Challenge! Every year I try to watch the Japan Nationals live. One of my goals is to watch the individual kata to make my own prediction who will win each round before the judges raise their flags. The current Shiramizu intern normally does this challenge with me. Generally I watch the division that starts first, men or women. Only in 2005 did I get 100% correct, so every year I keep up this challenge. So today for my personal practice, I'm going to review all the 8 main shitei kata. Infrequently I will practice them because our high school club accepts all karate styles. 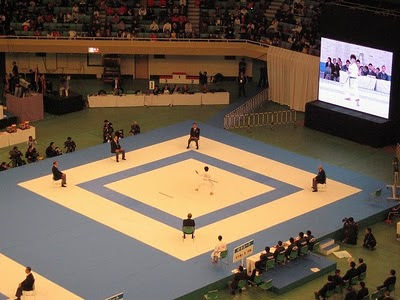 At last year's Japan Nationals, during the individual kata events for the 1st and 2nd rounds for women, I was able to predict all except for one match correctly! And even the match I got wrong, it was split 3-2 so I don't feel so bad. Actually, by the 2nd round I was not only predicting who would win, but the number of flags for each competitor too. Ooo, spooky. Kata- competition is like a lottery, it all comes down to the kata-judges knowledge of other styles. And what you prefers as a person, it’s like competing in music, witch is better Mozart or AC/DC?